When I heard Donald Trump compare undocumented immigrants to animals, I felt gutted. I took to bed and licked my wounds, a beastly thing to do. But there is not a lot of time to swim around in your own wounds when you’re an immigrant who works around the clock to help your family survive, to help so many families survive. So I cried the predetermined number of tears I had allowed myself then began to work on this, my theory of the animal. among young Latinx immigrants, after the Trump comments went viral, there was some radical reclaiming of the word “animal” that piqued my interest. I’ve heard a lot of border crossing stories. I could never cross the desert. Probably neither could you, unless you did, in which case you know that what you did is something extraordinary that goes against the course of evolution itself. The desert was not meant for us. On a hot day in the desert, a person can lose over three gallons of water through sweat. The Sonoran desert can get up to 120 degrees Fahrenheit during the day in the summer, and scientists who set foot in this desert, North America’s hottest, will hear a silence so deafening that one of them mused, “I wonder, did all the animals just suppress all of their behavior for the rest of the summer, or are they just dead?” But they’re not dead. There are some 60 species of mammals, 350 kinds of birds, 20 different types of amphibians, and approximately 100 reptiles in the Sonora. They’re all just laying low, doing their best to survive. They say we live in the shadows. That’s the metaphor the media likes to use about undocumented immigrants. It never made sense to me. We’re everywhere. When I go to my neighborhood in Queens, we’re not scurrying in corners avoiding sunlight; the women are getting their hair blown out in Dominican salons and the men are wearing bright soccer jerseys and taking their kids out to ice cream. And I look at those kids and think, goddamn, you’re going to grow up to get higher SAT scores than poor Jared Kushner did, bless his heart, and you’re going to tell your kids and your kids’ kids’ that the solution to every ailment is chamomile tea. And so our people live. I like to think of us as beautiful birds who live perched on very tall branches of very tall trees. We’ve made it so that you can’t find us but our world is rich. I knew that under the Trump administration things would be bad. I was hopeful it would be nothing we hadn’t seen before, but the situation has become alarming. I think about the animals that have evolved to survive in the most inhospitable of climates. The sand gazelles of the Arabian desert, lithe and cream-colored with tall black antlers. When it gets too hot, their hearts and livers shrink. Their hearts can shrink by as much as 20 percent and their livers by as much as 45 percent. With their vital organs shrunk, their breathing can slow down, and they do a lot less of it—breathing, I mean—and when they breathe less, there is less of a chance for water to evaporate. I think of cacti, who have spines but not leaves, and who have thorns to protect them from predators. I think of camels, who have the thickest furs at the top of their bodies to protect them from the sun’s rays. I think about turkey vultures who piss on themselves so when that water evaporates from their legs, heat leaves their bodies with it. These animals evolved to survive. Surviving is their job—expending just enough energy, preserving just enough water, expelling just enough moisture that they will live to see another day. And for so long I have seen them as crazy little apocalyptic mutants to admire, creatures that know how to thrive in the harshest of circumstances, against all odds, in defiance of the Lord’s own taste for arbitrary violence. I have a tattoo on my arm that says mutant. My father is 54 years old. He has lived in this country for 30 years. He has two grown children who have fetched the American Dream for him and laid it at his feet. He is aging, and frail, and his heart has already given us a warning over a four-day hospital stay. He just left a job where, for spare change, he had two hours to clean an industrial kitchen, an industrial fryer, refrigerator, stove, oven, sink, wash the dishes, wash the dishwasher, take out the trash, sweep, mop the floors, and clean the garbage chute in a kitchen. What does he live for, having given decades of his youth and his taxes and his children to this country? For most of these 30 years he lived for his kids. And now? To see another day. What do you do when the American Dream means simply clawing your way to wake up to another day not in chains? I am far from the first person to have said this, but it bears repeating. 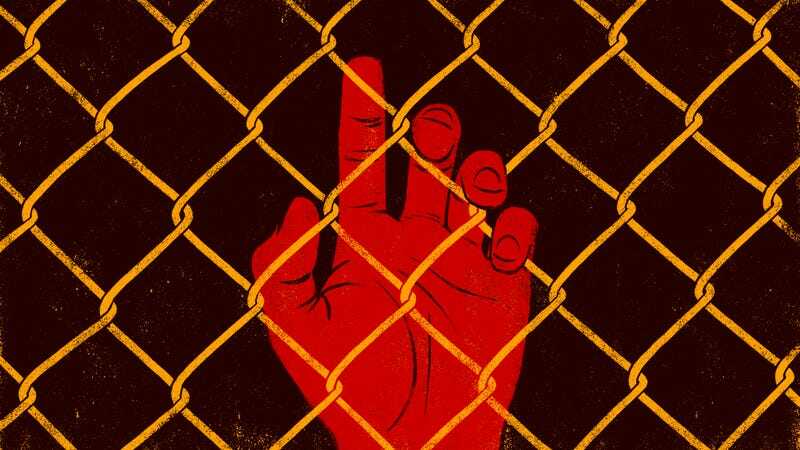 The most alarming aspect of Trump’s comparison of immigrants to animals is that it is the first step towards dehumanizing us—and, historically, we have seen the consequences of this dehumanization. In Mein Kampf, Hitler described the Jewish people as spiders, vermin, and parasites. Nazis forced them into ghettos by claiming they were trying to contain disease, and after denying them access to clean food, water, and medicine, when people obviously got sick, they gleefully publicized their illnesses. Closer to home, in the United States, the government established internment camps for Japanese Americans only after they had spread propaganda that depicted Japanese people and their children as having animal-like features, depicting them as monkeys and monsters. As this administration now calls immigrants animals, and the government visits parcels of land where it’s said it will consider building “tent cities” that can hold between 1,0000 and 5,000 children, it’s best we not look away, not for a second. The dehumanization programming has begun. They think of us as pests, so they are trying to drive us out of our homes, for what is the Republican drive for our self-deportation if not a plan of fumigation? They are cranking up the temperature in this here little desert. Our adaptations will come to fail us. The dehumanization programming has begun. Some of our kids are already in cages. History has shown us what can come next. There are 11 million people in this country and we are among the smartest, bravest, most ingenious, most creative, most cunning, craftiest motherfuckers out there. We are your neighbors, your friends, significant others, teachers, students, co-workers, employees and people you have no relationship to but whose absence you would feel, whose missing passion, love, and work ethic would starve the world’s most famous democracy. Does this country think we’re animals? Claudia Patricia Gomez Gonzalez was killed at the hands of Customs Border Police last month in Rio Bravo, Texas as she was entering this country to pursue her education. The agent was a 15-year veteran who only had to fire one round—in her head. I logged onto a hunting message board to see if the killing, a point-blank killing, was ethical for hunters. The board I settled on was titled Is a head shot ethical? “Big no on the head shots. Too hard to do and extremely graphic if it does work. Remember, hunters have an image to uphold,” one commenter said. The entire message board was in agreement. I’ll say one last thing. During one sleepless night, a few months ago, I read everything I could about animals in the Sonoran Desert because nearly all my friends had crossed to get here. (I took a plane.) I studied all the animals they would have encountered during their crossing—the Gila Monster, the desert centipede, the coyote, the gray fox, the javelina, the kangaroo rat, the Pepsis wasp, free-tailed bats, vultures, Black Widow spiders, tarantulas, scorpions, rattlesnakes and kingsnakes and boas, bobcats and mountain lions, lizards big and small. I memorized their names. I recited them with great reverence under my breath. The animals that could have killed my friends but didn’t. They welcomed the sacred and the vulnerable into their home, the most inhospitable of homes, and saw to their crossing alive. Some of my friends looked at these animals right in the eye and said they saw an understanding. Now I ask you to look at those among you who defile your species, and ask what makes them so big and grand. We’ve been quiet long enough. The beasts of the crossing have been pushed into the light and we will not go quietly. Karla Cornejo Villavicencio is a writer and Emerson fellow living in New Haven, Connecticut.